I could never have imagined that Richard Ayoade’s second feature film as a director would emerge as a cross between the film version of George Orwell’s 1984 and Mike Judge’s classic workplace comedy Office Space, but that is what sprung to mind as I watched this most unusual of pieces. Having established himself as a comic actor in television series’ such as The Mighty Boosh and The IT Crowd, Ayoade made a very impressive debut as a feature director in 2010 with Submarine, a film that was well received by critics and audiences alike. For his sophomore directorial project, Ayoade has followed in the footsteps of Bernardo Bertolucci, David Fincher and Denis Villeneuve, among others, in turning to a 1846 novella by Russian writer Fyodor Dostoyevski for source material. In fact, it’s probably fair to say that all doppelganger film narratives are inspired by Dostoyevski’s work. Although Submarine isn’t possessed of the over-the-top outlandish humour that is a staple of Ayoade’s television work, there are still plenty of laughs to be had. 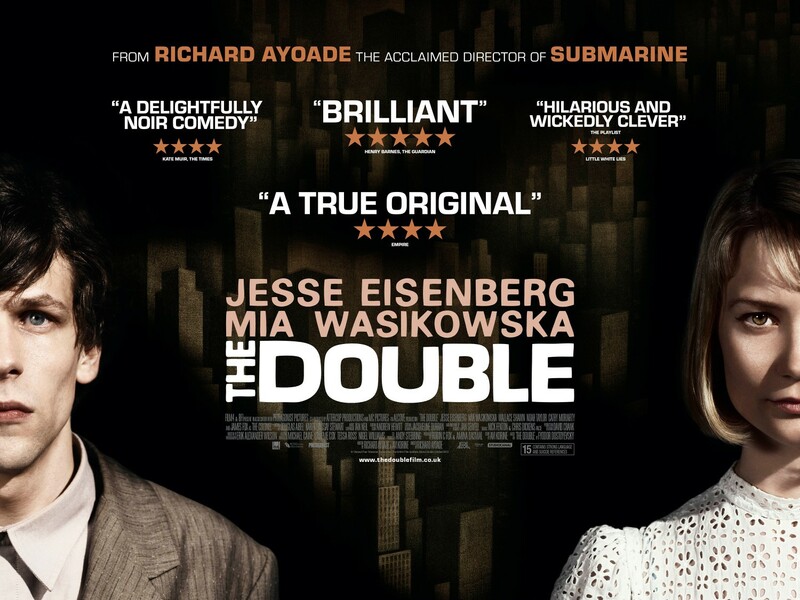 With The Double, Ayoade delivers a much darker tale – both visually and narratively – that is as much psychological as it is satirical. 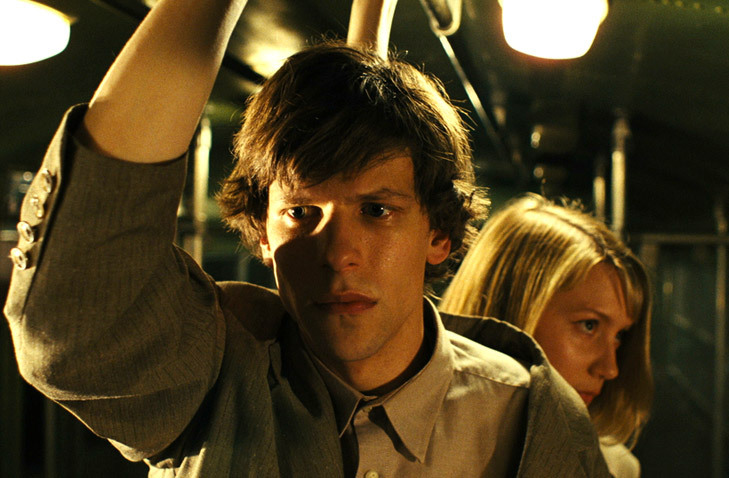 Jesse Eisenberg plays Simon James, an industrious worker for an unnamed organisation run by a somewhat mysterious entity known as The Colonel (James Fox), a character not far removed from Orwell’s Big Brother. In fact, the colourless cubicles in which the employees work and the primitive equipment they operate to undertake dreary meaningless tasks is so reminiscent of John Hurt’s Winston Smith in 1984 that I found the similarities uncanny. Despite his commitment to his work, Simon is all but invisible to his boss Mr Papadopoulos (Wallace Shawn) and his co-workers, including Hannah (Mia Wasikowska), the object of his affection. Furthermore, his mother (Phyllis Somerville), who resides in a nursing home for which Simon, of course, is being overcharged, derides him at every opportunity. When James Simon (also played by Eisenberg) arrives on the scene as a wunderkind new employee, Simon’s fortunes go from bad to worse. Despite the fact that Simon and James look identical and wear the same beige suits, the latter oozes confidence and charm and uses both to ingratiate himself with Papadopoulos and Hannah, sending Simon further into the throes of despair. Having filled the leads in Submarine, Craig Roberts and Yasmin Paige take on much smaller roles here as a detective and Mr Papadopoulos’ daughter respectively, with the likes of Sally Hawkins, Chris O’Dowd and Dinosaur Jnr’s J. Mascis also making cameos of varying import. As Simon, Eisenberg initially presents like he has done in so many of his other films; a highly intelligent yet socially awkward outsider. However, once James enters the picture, we see another side to the actor that is refreshing, even if the actions of this character are somewhat nefarious. Needless to say, Wasikowska is luminous amid the gloom as the quirky Hannah, continuing her upward career trajectory with another interesting role that she executes to perfection. Ayoade is to be commended for refusing to comply with genre or audience expectations, crafting a blacker-than-black noir comedy that references (intentionally or otherwise) many other films and filmmakers yet still presents as a somewhat original vision.